← 1686 Point Ride, GB Team Selection & Hurley Win! So myself and a few of the other GBR team members have been asked to put on a freestyle kayak display at the London Boat Show to be held at the Excel Centre. Now this won’t be your usual flat water flailing around we have a bigger that olympic sized swimming pool to play with complete with a cable tow system, ramps, sliders complimented with lighting and smoke machines and a huge TV screen to show actual whitewater footage. But as part of this the organisers wanted us to go test out the ramp/ towing system prior to the show so that they can work out how best to set everything up. In the UK right now we’re in a very dry spell but also its been very cold so anywhere suitable to test everything has been frozen solid. Rob Harris one of the organisers had got the call that a cable tow facility in Abersoch, North Wales had thawed and was good to go. So last Sunday we headed to Abersoch to an awesome cottage where we all gathered and stayed the night. This place was awesome with its wood burning fire, satellite TV and en-suite bathrooms it wasn’t at all what I was expecting. We woke up Monday morning and headed to what turned out to be a very frozen lake. 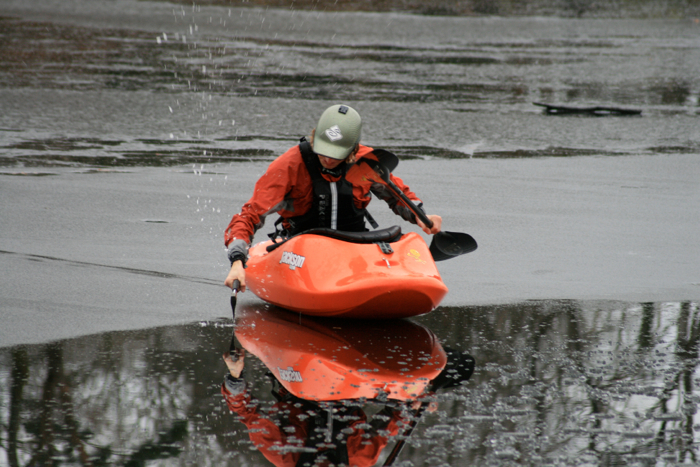 We almost gave up when we couldn’t break the ice by throwing rocks and logs at it, but 3 inch thick ice didn’t stop a bunch of desperate whitewater deprived kayakers from getting on the water and in the air.